Hello all! 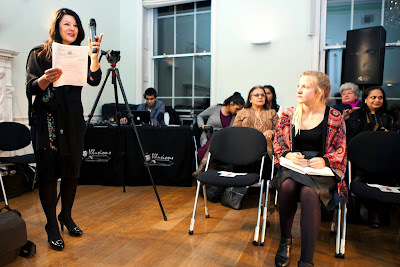 Last night I went to the Strand of Silk fashion show at Asia House in London. The event had such great energy and I even met a fellow blogger there who I will talk about in another post soon. The show was all about taking traditional Indian embroidery and lace, and pairing it with more modern silhouettes. The jewellery was all from Diagold, and was simply exquisite. Here are some of my favourite outfits from the show. I really like this take on a modern jumpsuit, covering with pretty embroidery and pearls. The above is one of my favourites. The white dress is very elegant and the statement jacket is a nice addition to the silver ensemble. These red dresses are so pretty and I particularly like the one with the red and orange skirt. It reminds me of a flame. This is the jewellery designer saying: 'I believe every woman should wear jewellery'. Some of the pieces shown in a pre-show exhibition. Here is a photo of me at the show courtesy of Asia House. My Kimono is from TK Maxx, leather skirt is vintage and plain black T-shirt from M&S. You can check out Strand of Silk's clothes HERE. I had a lovely night filled with fashion and macaroons. Which design is your favourite? Those dress would be perfect to wear on here in Doha!